We can't speak about Turkish cooking without paying special tribute to the 'dolma' (dole-MAH') and 'sarma' (SAR'-mah). 'Dolma' means 'stuffed thing' and 'sarma' means 'wrapped thing.' These are general terms used for many varieties of vegetables and leaves stuffed with meat and rice fillings. 'Dolma' and ' sarma ' can be very time-intensive to prepare. They are usually made with loving care by the lady of the house. Making them "the right way" is very subjective, but it's a matter of pride for almost every cook. Mothers size up daughters-in-law and family members judge one another quietly on their 'dolma' and 'sarma'-making skills. Even former president Süleyman Demirel's wife was famous for stuffing and wrapping her own dolma and sarma. Stuffed and wrapped vegetable dishes are common in many cuisines throughout Eastern Europe, the Mediterranean and the Middle East. In Turkey, favorite vegetables for stuffing include zucchini, bell peppers, tomatoes, eggplants, and onions. For wrapping, the most popular are vine leaves, collard greens, Swiss chard, and cabbage. First, let's talk about 'dolma' served as a hot main course. In this case, vegetables are prepared with a meat filling, then stewed slowly in their own juices. They are served hot topped with a dollop of plain yogurt. Assorted vegetable 'dolma' make a wonderfully light and colorful meal, especially for company. Preparation of the 'dolma' involves several steps, but it can be fun. First, a small cap is delicately cut from the top of each vegetable, then the center is scooped out with a small teaspoon. After salting the insides, simply fill the hollow vegetables with your meat filling, replace the cap and steam to perfection. One of our favorite main course 'dolma' recipes using summer squash and ground beef is called 'kabak dolması' (kah-BAHK' dole-MAH'-su), or stuffed zucchini. If you're not crazy for vegetables, all's not lost. You still have the chance to enjoy 'dolma' as a hot main course. Did you know that cuts of meat and poultry stuffed with rice, bulgur, spices, and nuts also fall into the 'dolma' family? Boneless chicken thighs, whole chickens, and quail, legs of lamb and squid are only some examples of the endless varieties of mouth-watering 'stuffed things' in Turkish cuisine. Fish and seafood are also delicious stuffed the Turkish way. Fillings made with rice, stale bread, fresh herbs, tomatoes and sometimes cheese grace the tables of many restaurants in coastal cities. One of our favorites is 'kalamar dolması' (kal-a-MAR' dole-MAH'-su), or stuffed squid. It's a luxurious dish from the Aegean region of Turkey made with very basic ingredients. If you're already a fan of 'dolma,' keep on reading. You'll be happy to learn that cold varieties of 'stuffed things' are just as important and plentiful as the hot ones. Rice-filled 'dolma' are usually served as part of the meze table, or as a side dish accompanying the main course. They feature nutty, wholesome fillings made with rice or bulgur, onions, nuts, dried fruits, and spices. Each region of the country, and in fact each family, make their rice filling just a little differently. Cold 'dolma' are cooked and served with generous amounts of olive oil. The oil helps the rice and other ingredients bind while cooking and adds to the wonderful flavor. More oil is drizzled over the top before serving. This helps keep the 'dolma' plump and moist. It also preserves the dish, so it keeps longer in the refrigerator. Small green Bell peppers and eggplants are some of the most frequently stuffed vegetables cooked in olive oil. Stuffed mussels, or 'midye dolması' (mid-YEAH' dole-MAH'-su), are also made with the same fragrant rice filling and served as an appetizer before fish meals. Stuffed squash flowers, considered a delicacy, also use the same filling. For example, the fragrant rice filling used to prepare vine leaves in olive oil is the same filling we use in our recipe for stuffed mussels. Learning to prepare 'sarma' can take some time, but it's well worth the effort. Once you learn how to wrap, you'll gain speed and confidence. Then, you'll be hooked like we are. We actually look forward to the time we spend parboiling leaves, cutting them into perfect shapes and wrapping them around little bits of filling until they all look perfect. So how do you decide what to wrap? This often depends on the time of year and where you happen to be. Vine leaves and white cabbage 'sarma' are more common in the Aegean and Mediterranean regions. 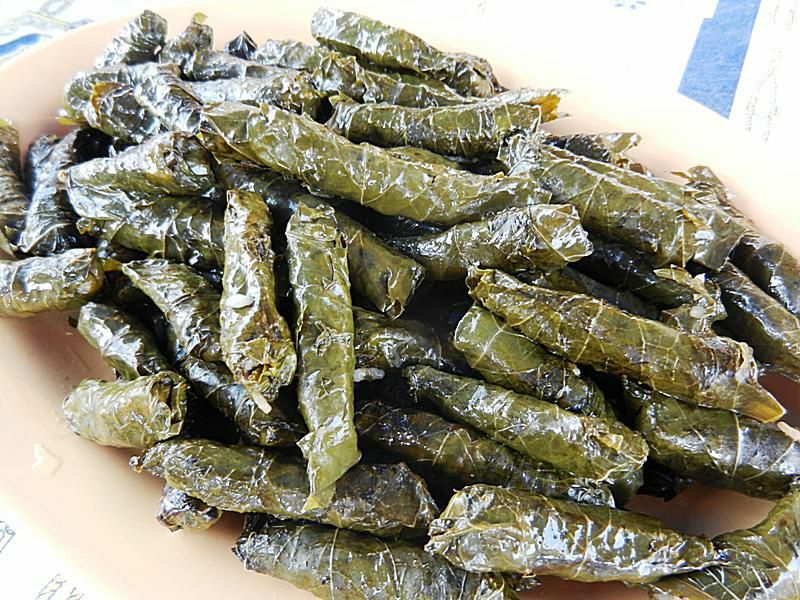 Near the Black Sea, other leafy vegetables like collard greens and Swiss chard wrap everything from lamb and beef, fragrant fillings of rice or bulgur - even sardines. As you go eastward, the fillings get redder and spicier. Rice and pine nuts are seasoned with paprika, ground sumac and some tomato or red pepper paste for a spicy twist. If you have trouble deciding how to get started, venture out to your local supermarket or greengrocer to see what fresh vegetables and leaves are available. We still discover new things to be stuffed and wrapped. TIP: If you can't find fresh leaves for wrapping, you can always buy vine leaves in brine. They are usually found near the pickles or in the Greek or ethnic foods section of your supermarket.